Hello high school physics teachers! My name is Rob Pearson, and I’m director of microelectronic engineering programs at Rochester Institute of Technology. I really like what I do and I want to tell you why. I also want to tell you why I am sharing this with you. I bet you would like to see students more engaged with the concepts you teach and the math employed in your courses. I am an engineer, so I think about problem solving (applications) first and basic science second. But like any good engineer (think MacGyver, to use an outdated reference) I know that I need to be handy with tools like math and physics if I am going to do anything useful. Come to think about it, why didn’t MacGyver ever say he was an engineer? What if your student could help solve challenging problems, use math and science every day, and have a rewarding career and also make a good salary? Typical bachelor of science graduates of RIT’s microelectronic engineering program receive multiple job offers with average starting salaries in the $60-70k range. Now back to what I do as an electrical engineer. Some aspects of electrical engineering can be dry and theoretical, but I fabricate semiconductor devices — millions of them on a chip and billions of them on each silicon wafer. The process of making these “magical” semiconductor systems is intricate and uses lots of physics, optics, mechanics, chemistry, you name it. So how does this relate to your physics course? Let me give you some examples. You teach about the Lorentz force and the right-hand rule. You could use a motor winding to illustrate the usefulness but I can give you another example the mixes physics and chemistry. We introduce elements from groups III and V on the periodic table into silicon (group IV) to change the conductivity of the silicon and make our devices. One way to introduce these elements is by ion implantation. Ion implanter functionality is based on the Lorentz force. We use tunable electro-magnets to sort ions in a vacuum by mass to charge ratio and then accelerate them using a variable high-voltage (200,000 V) supply. 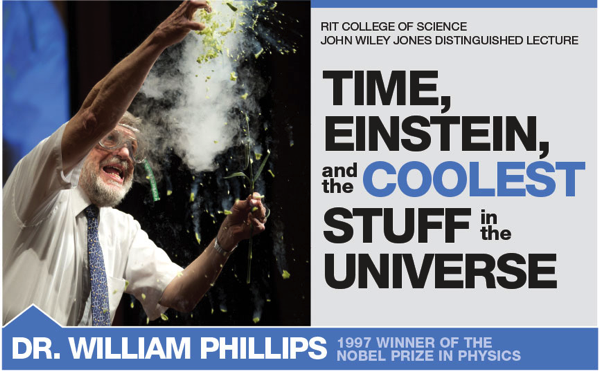 There is plenty of physics to talk about in this tool. Another example is a micro-electro-mechanical system (MEMS) device called an accelerometer. 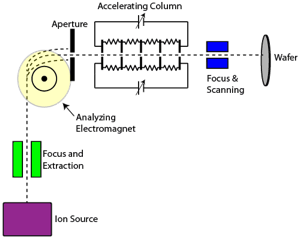 It consists of a tiny mass on a tiny beam and when the mass is accelerated it produces a proportional electrical signal. But wait, there’s more! It’s great that I can use these basic science courses and concepts in what I do, but what I really like is communicating the exciting possibilities of what has yet to be designed and built. Look at the changes that have occurred in our phones over just the last five years! They have touch screens, accelerometers, Global Positioning Systems, maps, computers, music players, TVs, videos (3D too! )… they can be video projectors, photo albums, and gaming systems. And that’s just one of many systems that rely on semiconductor products. What will your students do if they take up a career in this challenging field? Do you remember the tricorder that Dr. McCoy had on Star Trek? That portable medical lab in one compact unit is nearing reality. Great strides are being made in the intersection of electronics, biology, and chemistry. Further miniaturization of electronics is needed to take our current sci fi tech and turn it into practical high tech. The biggest challenge I face running an undergraduate college engineering program that focuses on microelectronics and semiconductor processing is finding bright young high school students who even know that this field exists. Please help us spread the word. 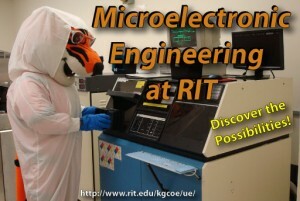 I hope that maybe you can encourage an interested student or two of yours to go on to study microelectronics or nanotechnology in college, and invite you to learn more about our programs and microelectronics by visiting our web page at http://www.rit.edu/kgcoe/ue/. Well, it’s back to school tomorrow and, like each summer, I didn’t accomplish nearly as much as I had hoped, but probably accomplished more than I should have expected. I had a chance to meet and network with a number of physics teachers in the area, making some new friends in the process. I spent quality time with my daughter, including a trip to Sesame Place outside of Philadelphia, a family reunion at my folks’ riverhouse, and quite a few fun days at the zoo. I taught a few classes at RIT, worked with Rochester City School District teachers on developing and training in Problem-Based Learning (PBL), and even found a few spare moments to read purely for entertainment! One of my major goals this summer was to get a good start on the “Honors Physics” book. Last spring when APlusPhysics: Your Guide to Regents Physics Essentials came out, I received lots of great feedback, especially from students, but also heard from a number of physics teachers in other states asking about a version of the text that wasn’t limited to the NY Regents curriculum, but was generalized for a typical Honors Physics class. Initially I had planned this follow-on book to be a guidebook for the AP-1 program when the AP-B course was split, but after several years of fuzzy timelines and fuzzier details, I decided to start on the physics review book I had initially wanted to write. Taking input from those who were kind enough to give me feedback, as well as targeting the book as a rough attempt at hitting the AP-1 targets with what tentative details I could scrounge from the powers that be, I finished my outline up in the spring. What I found, however, was that this undertaking was considerably slower than the Regents review book. Why, you might ask? Well, to begin with, the Regents Physics curriculum is a “minimum” aptitude test, in my opinion, which makes it fairly shallow. Further, the test is well established and in the public domain, providing oodles and oodles of questions to pull from, both for tailoring of instruction, as well as for inclusion of examples. Finally, after having taught 10 Regents Physics sections in the past three years, I don’t think it would be a stretch to state that I could recite the curriculum in my sleep. Migrating to the new book, I have the distinct advantage of starting with the baseline material from Regents Physics Essentials. However, the outline I’ve written significantly expands the scope of the course, with the goal of providing Honors Physics instructors the ability to pick and choose chapters and sections to fit their courses. This has led to many, many hours scouring the Internet for state and district standards both near and far; discussions with physics teachers across the country about what they want from such a book, what they don’t, and some hard decisions about what compromises and cuts have to be made to provide a resource that will be of the greatest value to the greatest number, while maintaining my personal goals for the book as well as keeping the page count in check so as to maintain an acceptable price point. Of course, I’d love to keep everything, but the problem with a 700-page review book is three-fold: first, the cost becomes prohibitive; second, students won’t read it; and third, that’s starting to move into textbook territory, and there are already many terrific physics texts available for this level. But, I’m proud to state that the first draft of the review book is coming along fine, with more than 200 pages in fairly strong shape. I’ve been spending a lot of time working on rotational motion, attempting to streamline basic concepts such as rotational kinematics and torque in a way that follows logically and highlights the parallels of translational motion, without getting bogged down in confusing terminology and unnecessary depth. This should nearly complete the mechanics section of the text. I’ve also done initial work on some of the additional chapters, such as fluid mechanics, thermal physics, semiconductors, and cosmology. Besides initial outlines and some basic illustrations, I’ve been especially focused on the semiconductor chapter… not many introductory courses go into semiconductors, and I’m thrilled at the opportunity and challenge of providing basic semiconductor physics review at this level, consistent with the work I was involved in a few years ago developing the Semiconductor Technology Enrichment Program (STEP) with Rochester Institute of Technology’s Microelectronic Engineering Department. So, as school starts up again, progress in the writing department will, of necessity, slow down. 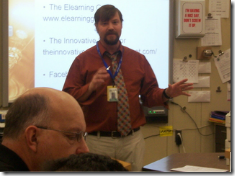 I’m excited to meet this year’s class of students, jump into Skills-Based Grading (SBG) for the first time, utilize a number of short videos for concept review, increase the amount of inquiry in my classroom, reduce the amount of lecture time, learn more about physics modeling, and on and on and on. But I’m setting aside specific time each morning to keep working on the book project, and I continue to value whatever input and guidance you can provide in this endeavor. And, of course, the APlusPhysics.com website continues to grow — tutorials, videos, projects, forums, and blogs are all ongoing projects! Thanks for the continued support, and best wishes to you on an amazing 2011-2012 school year!